One of the most important things you can do is claim your business on Google+Local, and add as much information as possible, including photos and video. 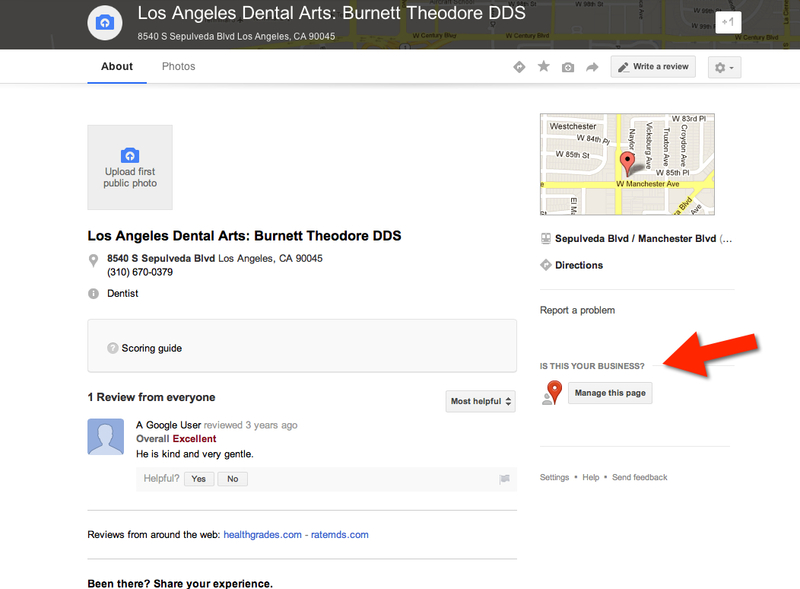 If you haven’t done it, go to maps.google.com, enter your practice name and find your practice listing, and when you open it, in the upper right hand corner (like in this page shown) you’ll see “business owner?” Click on that, and they will lead you through the steps to take ownership and edit the info. This is a must-do for every business. You can also go to www.google.com/+/business and start a page that way, and you should be able to find your business. I like going through the maps, so you can make sure it has the right listing. After you claim your page you will want to delete other google places pages that are associated with your business address, google penalizes places with multiple businesses operating out of a single address. Once you’ve done this, this specific URL is where you want to send your patients to review you on Google. Once you have some followers, Google will allow you to create a custom URL for your page. This entry was posted in Advertising, Dental Marketing, Dentistry, Online Reviews, Search, Social Media, Websites and tagged dental marketing, dental practice marketing, Google, Online Reviews, social media by Fred Joyal. Bookmark the permalink.